The Metropolitan in Downtown San Diego is located at 165 Sixth street in San Diego. 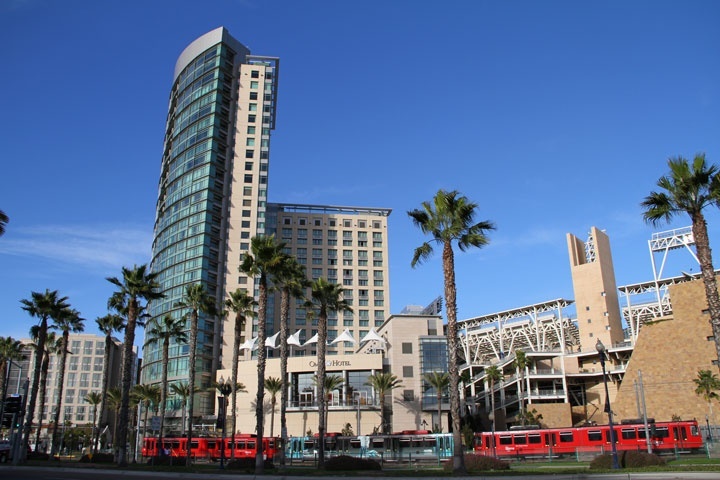 The Metropolitan sits on top of the Omni hotel and is an exclusive building consisting of 36 luxury high rise condos that sit adjacent to the San Diego Padres baseball park (Petco Park) and has great views of the Bay, Coronado Bridge, Downtown and Mexico on a clear day! The Metropolitan has it's own seperate entrance and lobby entrance with very strict security for it's members. Homeowners of the Metropolitan have thier own private pool facility on the 22nd floor as well as full access to the Omni Hotel pool, spa & fitness center as well as full time concierge and security. Residents also have use of the Omni Hotel's room service, laundry, housekeeping, catering, business center, valet and great restaurants. Condos on the south side of the building have direct views into the Padres baseball field and is a great place to live. The best part about the Metropolitan besides the first class service you recieve is the private sky-bridge the leads directly into baseball park. If you are looking for a first class condo in the downtown area of San Diego then the Metropolitan should be on your list. Homeowners association dues average $1,500.00 a month but are well worth it when you look at all of the amenities your receive. Below are the current Metropolitan downtown San Diego condos for sale. Please contact us at 1-888-990-7111 with questions regarding this building and any of the condos listed for sale here.